Our most popular model of wood burning fireplace, the Opel creates warmth in both design and heating function. The Opel fireplace has many different installation, product design and performance options to achieve your preferred finished look of the appliance and ambiance of the overall room. The Opel 2 has a fantastic firescreen option that allows the unit to be operated with the doors open. The firescreen option enhances the fireplace experience by allowing amplified sounds and aromas while burning a fire in the open fireplace. This is a very rare feature option that isn't available on any other units, and is available in Canada only. ​The Opel 2 has a double front door and the Opel 3 fireplace has a large single front door. The standard Opel fireplaces come with black finished doors and there are other fireplace door options available - pewter or 24k gold plated finish. 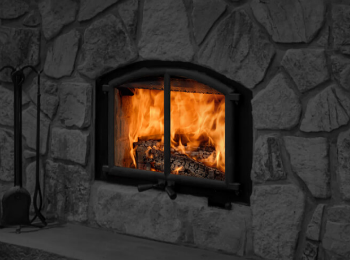 There are many ways to increase the heat distribution out front or other areas of your home. The thermostat control option provides an easier way to maintain a constant temperature. 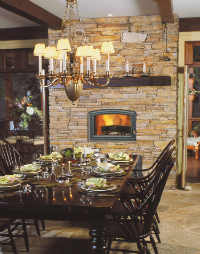 Internal blower fans assist in pushing heat out front of the fireplace or inline fans can be used in combination with air vent kits to move the hot air to areas that are further away. These fireplaces also have the ability to be connected to a central heat ducting system that is dedicated to the sole use of the fireplace - contingent to local codes and AHJ approval. Both the Opel fireplace models have a catalytic combustion option \ models. The Opel catalytic combustion catalyst models reduce air particulate emissions, and are EPA certified to 2.48 g/hr. The downside of catalytic combustors is that they require more maintenance, can be prone to problems, have a life expectancy of 5 years and are fairly expensive to replace. The digital thermostat option will help monitor the catalyst temperature. 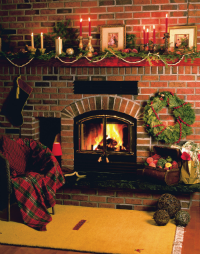 When you purchase a fireplace from Canadian Chimney, our annual service plans are provided at reduced rates. We also provide our customers with worry free maintenance plans, hassle free service, and extended warranty options.